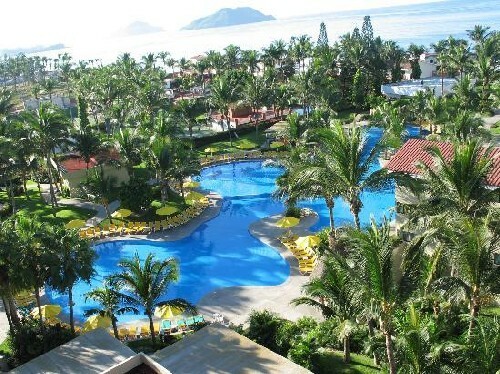 Mayan Sea Garden Mazatlan in Mazatlan, Mexico - Buy a 7 Night Stay in a 1 Bedroom Suite! Enjoy 7 Nights in a 1 Bedroom Suite at the Mayan Sea Garden Mazatlan in Mazatlan, Mexico! This luxurious resort offers all of the services, activities, and amenities you could ask for on a tropical trip to Mexico. At Mayan Sea Garden you will find one-quarter mile of private beachfront property, three swimming pools, restaurants, lounge bars, pool bars, and cafes. Take advantage of the mini market, boutique, tobacco shop, and cyber café on premises. Children will enjoy the kids club, childrens pool, and childrens play area. Additional resort services include concierge and travel agency, baby-sitters, medical facility, Internet, room service, valet, and laundromat. Mazatlan, known as the Pearl of the Pacific, is the perfect mix of relaxation and adventure in a beach destination. Whether you need a romantic getaway or to spend time with the family, this is sure to be one of the best moments of your life. There are beaches for every taste – Isla de la Piedra for horseback riding and the Golden Zone where you will find a variety of restaurants and entertainment. Enjoy the Mexican cuisine, drinks and a walk on the beach. Looking for something more active, how about diving, fishing and even dancing. To enjoy world-class golf, there are several excellent courses such as Estrella del Mar Mazatlan. Mazatlan International Airport is located just 45 mins. away. Your unit at the Mayan Sea Garden has spectacular views of the resort’s lush gardens. Wrap yourself in the tropical elegance of your spacious room with modern amenities. Each room has a kitchenette and bathroom. Kitchenettes include electric stove, a small refrigerator, microwave, toaster, coffee maker, blender, cookware and crockery. To add to your comfort, you will also find a TV, air conditioning and telephone. All resort charges are signed to the room account, no cash in the consumption centers is accepted.